It’s 1pm on Friday afternoon and scores of people are queueing patiently outside a small cafe in the shadow of York Minster. The York Roast Co usually specialises in pork sandwiches and roast dinners, but today the crowds are here to sample the business’s surprise new hit – the yorkshire pudding wrap. The delicacy consists of a large flattened yorkshire pudding, wrapped around a mound of carved meat, stuffing and some token veg, smothered in a thick gravy. It is, as one customer describes it, “the ultimate comfort food”. The wrap has become a social media sensation after the company posted a picture on their Facebook page of the wrap glistening seductively with gravy. That post, which has had over 30,000 shares, was spotted by the BBC, who then published a short video online of the wrap being prepared with the bucolic tones of Dvorak’s “New World” Symphony – the music from the Hovis ad. That video has had 12m views on the BBC’s Facebook page at the time of writing, 11m more than a clip of Donald Trump’s threat to meet North Korea with “fire and fury”. It has been a surprising time for Wayne Chadwick, MD of York Roast Co. He has had to take on extra staff in his shop on York’s historic Low Petergate. “We really weren’t expecting this,” he says, taking delivery of 200 extra kilos of pork to meet the increased demand. 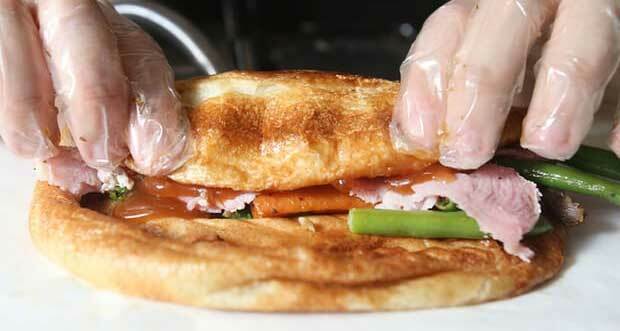 In many ways the yorkshire pudding wrap tastes exactly as you’d expect it to. The yorkshire pudding is pleasantly greasy, the portion of meat generous and the gravy thick and salty. It leaves you feeling satisfied, if slightly guilty. As Ashley Mand, a local estate agent queueing for his lunch, says, it is not really the sort of thing you’d have more than once a week. When the business first started selling the wrap in March it made up around 20% of sales. This week that figure is over 70%, and Chadwick now has plans to take the wrap nationwide….